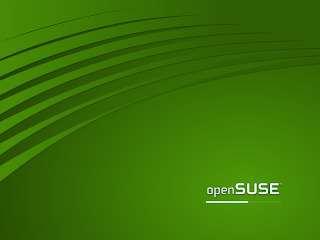 openSUSE 10.3 for My Friend: A friend asked me to install Linux for him several weeks ago. This is mainly because he got curious after seeing Compiz Fusion in action on YouTube. Since I finally had a lot of free time last weekend, I agreed to install Linux for my friend. The first thing that I considered before the installation was of course choosing the right distribution for him and his machine. 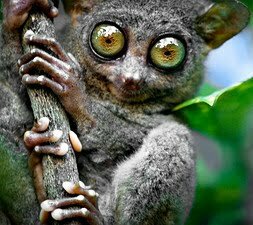 The first distro that came to my mind is openSUSE 10.3. That’s right. I know it messed up my main workstation but I wanted to give it a chance as it might properly work on other hardware configuration. With this, I can also find out if my horrible experience with openSUSE 10.3 was just one of those isolated cases. As always, openSUSE installation is straightforward but indeed very lengthy. If you are used to Ubuntu or PCLinuxOS, then there’s a big chance that you will loose your patience from waiting and might just “abort” the installation. As I believe that patience is a virtue, I was able to make it through the pain of waiting. After the install, I was glad that my friend’s computer was doing fine so far, as Grub was perfectly configured, and important hardware like USB, Ethernet, audio, and video were properly detected. Other improvement I noticed on 10.3 is its more responsive graphical installer compared to previous versions. 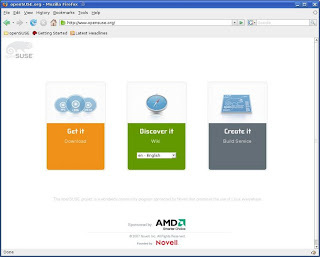 I had extensively used openSUSE 10.1 and have tested 10.2, so I am already very familiar with the new version’s UI. The one panel (instead of Gnome’s traditional two) uses a “Slab” main menu just like in 10.2. openSUSE’s desktop is very newbie-friendly, hence I expect that my friend won’t have trouble adapting to it. I also noticed that Yast opens a lot faster now compared to before. 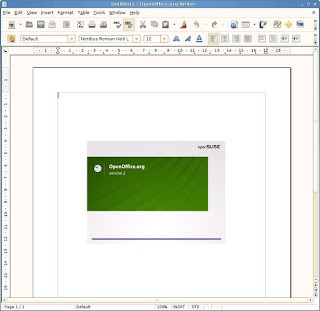 The look is really glossier compared to the previous versions of openSUSE. The artwork has a green theme. I hope my friend loves green (not just green jokes); anyway, it is very highly customizable, so he can easily change it to fit his needs. Now, because he wanted some “desktop effects”, I installed the necessary driver for his ATI card and luckily, it went well. Because Compiz is already installed by default, the desktop was blinging in no time. 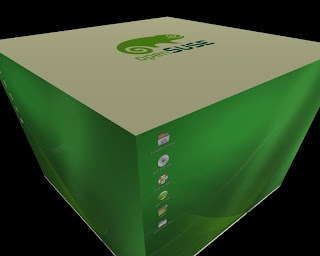 One of the main strengths of openSUSE is its package management system. Yast is just very reliable and so easy to use. But now that I’m getting used to Ubuntu’s Synaptic, I find Yast a bit sluggish. 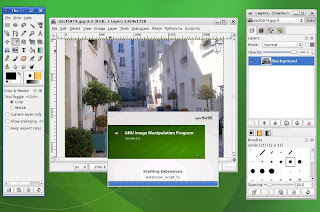 The good point is that OpenSuse has a wide array of latest software packages both out-of-the-box and from its repo. There’s also a 1-Click-Install Wizard to take care of those pesky codecs. Therefore, playing DVD’s, MP3’s, and flash videos will never be a problem in openSUSE 10.3.
openSUSE is tried and tested in terms of stability. I was very productive with the version 10.1 before that I heavily relied on it in almost all of my computing tasks . Unfortunately, when I upgraded to 10.3, I found out that it was unfit for my machine so I had to totally forget Suse. My friend is just very fortunate because his computer hardware seems to jell with openSUSE 10.3. But, I still can’t conclude if his machine is really stable enough as he’s been using it for only a few days. Nonetheless, he’s quite happy playing with the cool desktop effects and showing it off to his girl friends (he he). I was surprised that I haven’t heard a single whine from him yet, and he even told me that he’s totally enjoying his experience with Linux. openSUSE 10.3 certainly has plenty of enhancements like its more polished theme, faster boot time speed, and improved responsiveness. However, I think it fell a bit short on hardware support. In my friend’s computer, it worked like a charm. But in mine, its performance is very frustrating. The installation should also be improved, as not everyone has patience like mine. openSUSE still has enough room for improvement. I just hope that they will capitalize on their 10.3 achievements and learn from its blunder for their next major release, because definitely, I will give it another chance. A solid review jun. Pretty funny too. But I'm sticking with Ubuntu for now just to be safe. This is not a true review of openSUSE just because it's concentrated on Gnome. KDE is true openSUSE desktop, not gnome. Not starting a flamewar, just stating the obvious. I ment what I said. Gnome is not in any way better than KDE (the reverse is doubtful, either), just the review would be more fair if just a few words would be said about KDE or why not KDE. I understand this article is kinda personal experience review, but still.